I actually happen to like Crocs shoes — especially the newer Crocs flip flops. Though I have to admit, they don’t rank at the top of the list in terms of shoe fashion. I mostly wear mine to work in the yard, when I’m camping, and walking to the mailbox each day. Hey, if they’re good enough for the Royal Family, they’re good enough for me! But I also happen to like people who don’t like Crocs. 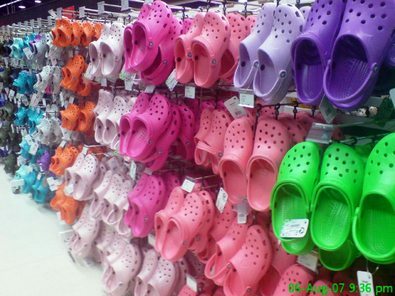 Check out this amazing collection of Crocs haters. I think it’s rather humorous! Read how these guys got their start… Check out their first “I Hate Crocs” blog entry. For photos, check out the I Hate Crocs Flickr group! For videos, check out these videos on YouTube. To an extent, the Croc-haters have a point. I mean, there are plenty of Crocs accidents that might warrant someone re-thinking the practicality of wearing Crocs. Alas, escalators hate Crocs, too. 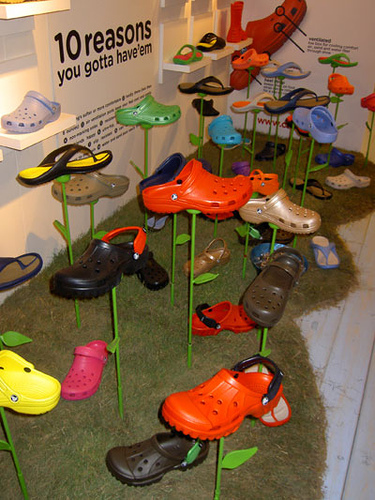 Ah yes… Crocs, you either love ’em or you hate ’em. And if you love ’em and you have a dog… then you’ll love these Crocs shaped dog beds!